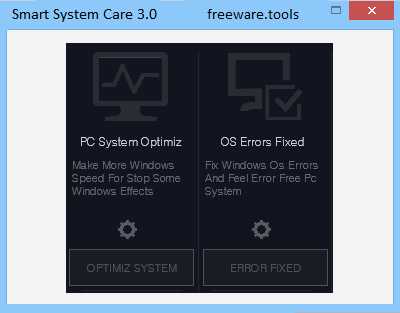 Smart System Care is a portable tool that allows you to clean junk files from your system, stop processes and services, clean your browser's cache, history or cookies and optimize your system. If you own a Windows computer, you are probably aware that sometimes it might perform slower, due to various forgotten background processes and services or junk files that might've piled up on your hard drive. In this case, you need to perform some maintenance operations like removing unwanted documents, closing unnecessary processes and clear your browser history. Smart System Care can help you with that. No installation is required to use this tool. Smart System Care can help you recover some of your computer's lost performance by performing certain maintenance tasks for you. Some of them include removing junk files, clearing browser history or stopping unneeded processes. Each of the operations is configurable, meaning that you can decide what actions are going to be taken in each case. For instance, you can specify which files should be removed from the "Junk Files Clean" menu, which services need to be stopped or whether cookies should be deleted or not. Although it might be confusing for some users, there are two "Maximize" buttons on the main window. One of them makes the window just slightly larger, while the other one lets you access more functions, but none of them expands the window on the whole screen, as it should. Aside from the four core functions that are displayed in the standard mode, you can also fix OS errors, remove spy apps, run all the tasks at once, hide the taskbar icon, enable automatic junk clean, toggle a mini system monitor, activate gaming mode boost and lock all the options. To wrap it up, Smart System Care is a handy application that can help you recover some of your device's speed by helping you clean junk files, stop unnecessary services or processes, clear browser history, fix OS errors or remove spy apps. It can be easily installed and lets you configure many of the operations it can perform, according to your needs.